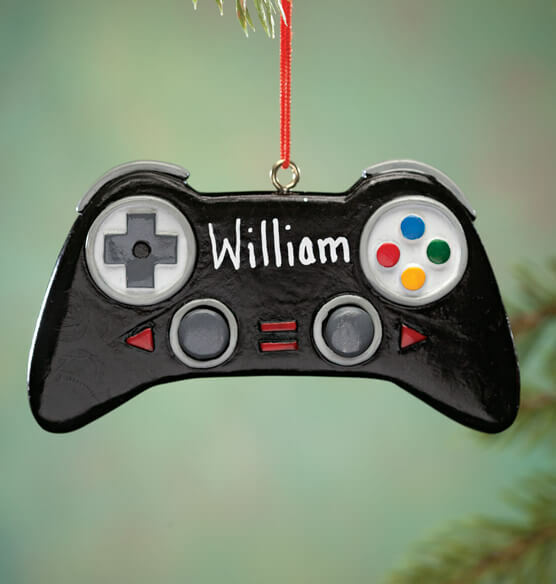 Equip your favorite gamer with this personalized video game controller ornament and enjoy immediate feedback in an old-fashioned smile! Compatible for any Christmas tree in highly detailed resin, this personalized Christmas ornament is a gift your gamer will love, year after year. We’ll personalize for the ultimate visual enhancement—scoring a win for thoughtful you! Specify name; limit 1 line, 8 letters/spaces. Resin. 3 1/2" long x 2" wide. This is the second time I have bought this item. It is detailed very well. The names that you put on them the letters are spaced out neatly. I would buy again the third time. He is 16 and loves video games. This is the perfect ornament! !